Theatre of Operations presents itself like an atmospherical and visual tale. The play stages a subjective study of the different types of confrontations found in civilisation. To the extreme limits of this range, on one side we find war, and on the other harmony. Strange characters appear in a harmonious post-apocalyptical landscape, they are observer-manipulators, some sort of clumsy scientists, survivors of a past time. These scientists are organising a laboratory to experiment on an other community of characters no less strange than themselves. The subjects of analysis are beings who are as much animal, as humain, or robots taken from a childish imaginary tale. Just like in “La Jetée”(“The Pier”) the film by Chris Marker, the subjects are moved around in the scale of time towards the futur, the past, childhood, anticipation… And this in the utopian goal of discovering an initial situation, a supreme mystery, which is that of the mystery of war. The experiment forms as such, an accelerated condensed fictional History of civilisation, with its achievements and its crashes. It balances between poetical drama and the absurd of the discrepancy. 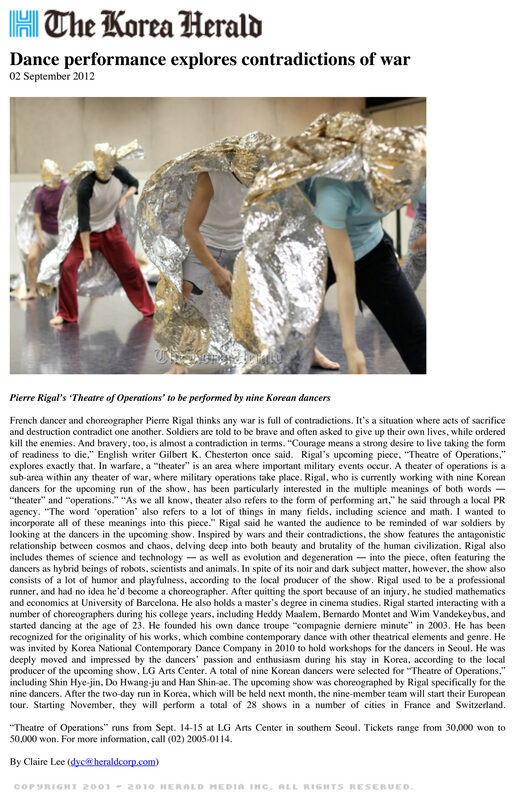 Compagnie dernière minute is subsidised by the Ministry of Culture & Communication/ Préfecture of the region Midi-Pyrénées, Region Midi-Pyrénées and City of Toulouse. 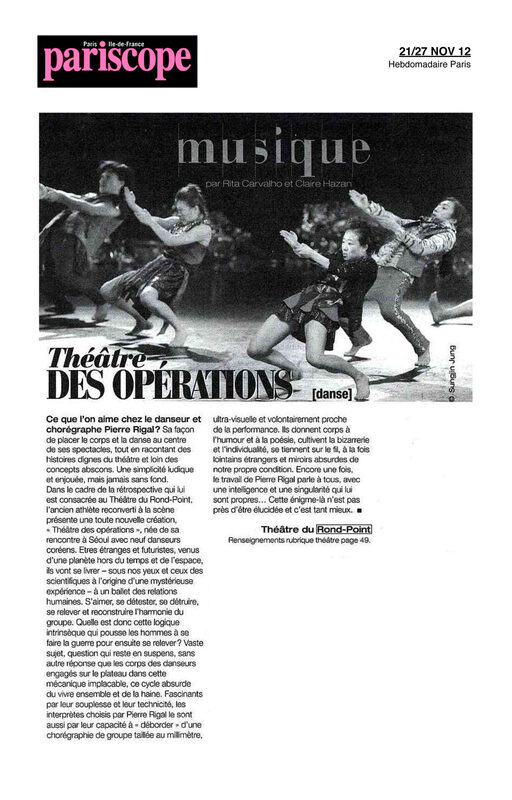 Compagnie dernière minute is supported by Fondation BNP Paribas for its project development. "Fascinants par leur souplesse et leur technicité, les interprètes...donnent corps à l’humour et à la poésie..."
"Cette pièce est une sorte d’accélération de la civilisation. " "Dance performance explores contradictions of war"